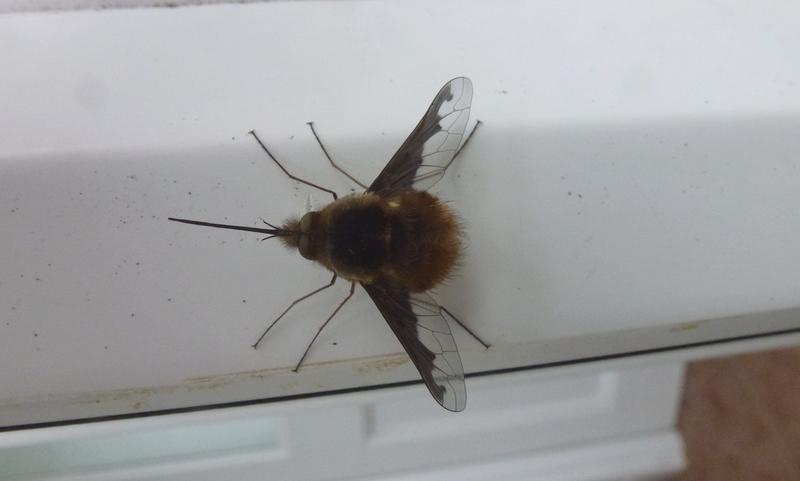 This is a bee fly and just to clear things up right from the start it’s a fly not a bee. Looking like a bee affords this fly some additional protection by appearing more dangerous than it actually is. This characteristic is known as Batesian mimicry and there are many examples of this evolutionary trait throughout the insect kingdom. A furry bee like body, variegated wing colouring and the long feeding spike give the bee fly a dangerous look. 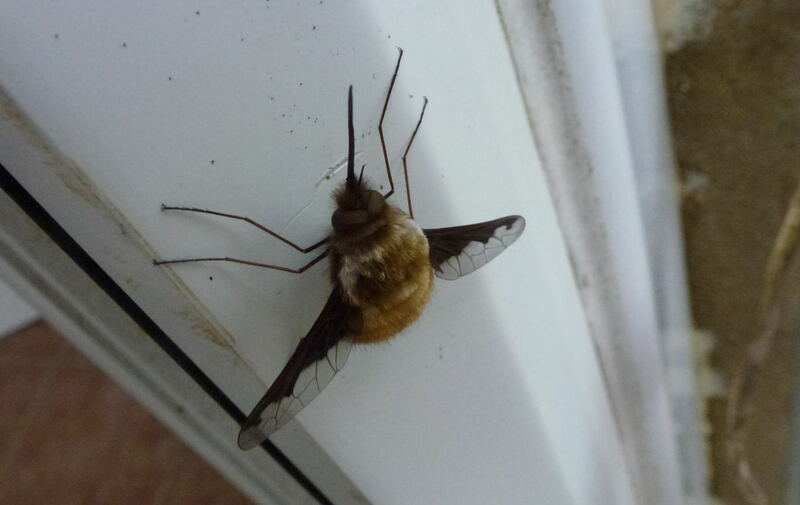 Whilst bee flies like to stay close to vegetation for protection they can also often be found basking in the sun on walls, leaves or in this case on an old UPVC doorway. This particular bee fly was photographed in March and was not scared off by us getting up close to take these pictures, this was probably due to the early time of year and low temperatures causing it to be sluggish. Despite its somewhat sinister appearance the bee fly is actually vegetarian during its adult life using its long pointy nose spike to drink nectar from flowers rather than as an offensive weapon. Bee flies do not bite or sting, they’re completely harmless*. The bee fly lays its eggs in or near other insect nests and the larvae that emerge make there way into the heart of their victims nest to consume the larvae of the unfortunate target. Ground dwelling solitary bees and wasps are a common target and bee flies are known to drop their eggs whilst in flight aiming for the nest entrance of their chosen hosts. Primed for take off but this particular bee fly is going nowhere. Once the bee fly larvae have consumed their victims they then remain in the nest over winter as a pupae and emerge as an adult in early spring. They may have a parasitic element to their life cycle but during their adult phase they play an important role as a pollinator just like the bees they have evolved to resemble. We haven’t witnessed it yet but bee flies apparently use their long legs to stabilise themselves whilst hovering over the flowers from which they feed giving them an almost hummingbird like appearance. So if you see a bee fly in your house, don’t be alarmed, don’t reach for the fly swat, let it back outside to pollinate your garden.